Comparison shopping the 2018 Honda CR-V and the 2018 Subaru Forester is like bringing Aesop’s “The Town Mouse and the Country Mouse” fable to life. These two compact, five-seat crossovers bring lots to the table, but do so with decidedly different personalities. The citified 2018 CR-V rates higher on our scale—a 7.0 out of 10—which isn’t unexpected given that it was just redesigned. The 2018 Forester’s basic design dates back five model years and it’s up for a redo, but sales climb annually and it rates a still strong 6.7 overall. 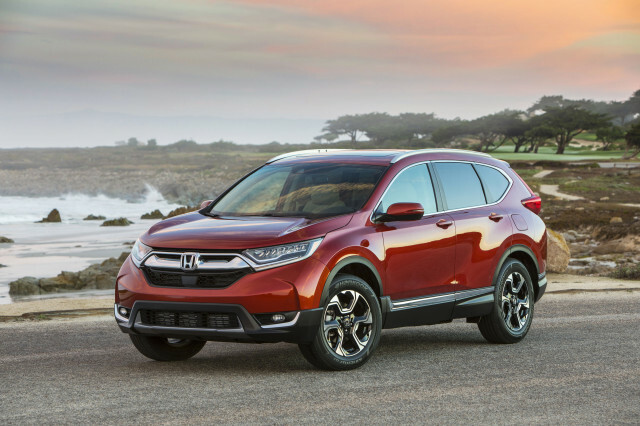 Thanks to its clean-sheet redesign, the CR-V looks and feels fresh. It’s as roomy as ever, with a high-class interior, a luxury crossover-grade ride quality, and decent turbo power in all but the base configuration. The Forester’s might shows through in ways that might not matter as much to some shoppers: all models boast standard all-wheel drive with an available off-road traction control mode, they sit high with 8.7 inches of running ground clearance, and they’re available with a manual transmission and a far more powerful turbocharged engine (although not together, unfortunately). Neither is much of a looker, if we’re honest. The CR-V’s otherworldly styling starts with a pronounced lower jaw of a bumper up front and culminates in a sprawling band of chrome plastic between taillights that jut out awkwardly. Things get better inside, especially on higher-specification trim levels with their plethora of upscale materials and warm hues that impart a tony, urbane look. The view forward isn’t bad, either, though hefty rear roof pillars and big headrests in the back seat rob the view astern. 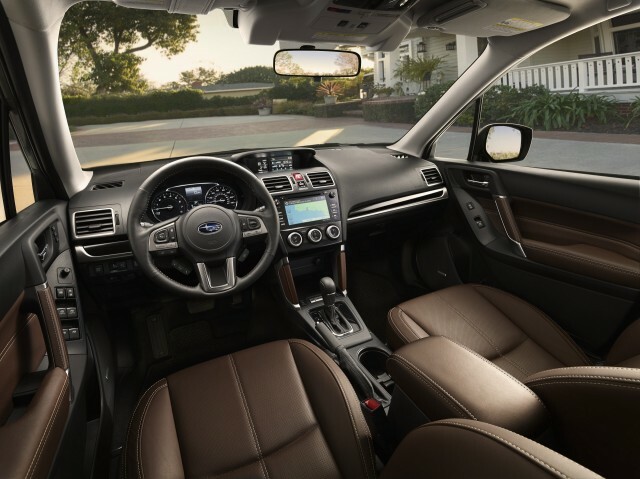 You won’t find the same classy digs inside the Forester. Its dashboard is plain, albeit well-organized, in even the dressiest Touring trim level with its rugged brown leather upholstery. The flip side to that is a stellar view out unmatched by even the CR-V thanks to Subaru’s commitment to especially narrow roof pillars, side mirrors mounted to the door sheetmetal rather than near the pillars, and tremendous glass space. Those details contribute to the Forester’s top-hat styling outside, but we think its toned, angular fenders lend it a bulldog-like look that has held up well. Both are at the top of their class when it comes to accommodating humans and their gear. Drivers in all but the base trim levels of the CR-V and Forester are treated to power driver seats. CR-Vs with leather go even further with a power passenger seat, but it’s not height-adjustable and we find the cushion to be lacking over long hauls. The Forester’s passenger seat is manual and it’s mounted unusually high. Rear seat riders get good leg room at the outboard posts and both have enough width for three adults to squeeze in for short jaunts. The CR-V treats cargo a little better with its ultra-low liftover height that includes a floor that can be repositioned for either a flat floor or one that’s sunken a couple of inches below the lip. It’s just the ticket for loading heavy items, like furniture from Ikea. By the numbers, the CR-V has 39.2 cubic feet of cargo volume with the rear seats upright, a figure that swells to nearly 76 cubes when row two is folded flat. The Forester’s cargo floor is a hair higher off the ground and doesn’t have the same trick floor, although its cargo cover can be stowed out of sight and its high roof means mountain bikes can be stored upright with their front wheels removed. Its capacity stands at about 37 and 71 cubic feet with the seats up and down, respectively. A power liftgate is standard on CR-Vs with leather and it’s available on all but the base Forester. 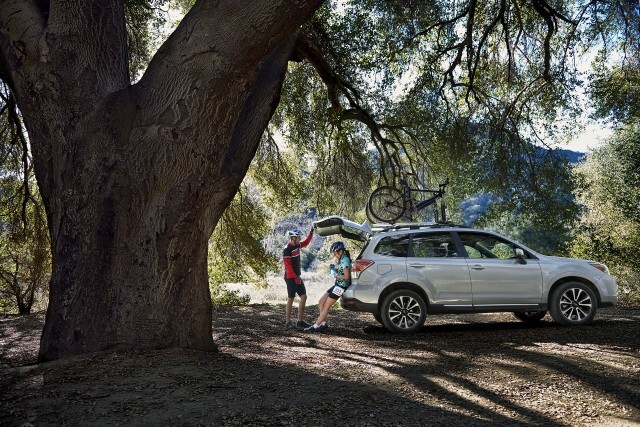 All but the base Forester feature standard roof rails for extra cargo. You’ll have to opt up to the range-topping CR-V Touring to save yourself the trek through Yakima’s catalog for roof racks; LX, EX, and EX-L trim levels have a flat roof with no gear-ready rails. Under their hoods, both crossovers offer a choice of two engines—but there’s a lot more than just numbers here. Base CR-Vs use a 2.0-liter inline-4 rated at 184 horsepower that’s adequate but hardly thrilling; EX and higher trim levels represent the bulk of what you’ll find on dealer lots and they swap in a more desirable 1.5-liter turbo-4. It’s not much more powerful on paper, but it supplies its grunt well off the line in urban situations. Where it runs out of steam is up grades, especially full of passengers and cargo. The CR-V’s engine mates well to its continuously variable transmission and all variants are offered with either front- or all-wheel drive. The Forester line starts with a 2.5-liter flat-4 rated at 170 hp, while a 2.0-liter turbo-4 with its commanding 250 hp is included on XT models. Base Foresters have decent, but hardly overwhelming acceleration and they require rigorous use of the throttle pedal. Fortunately, the optional CVT makes the most of the Forester’s base engine. It works better than the 6-speed manual gearbox that’s standard on base and Premium trim levels, although we applaud Subaru for catering to the niche-ist of niches with its stick-shifted Forester. Models with turbo power are robust, strong performers up long grades such as mountain passes, even if the engine can feel gruff at times and requires premium fuel. With all-wheel drive, both are among the thriftiest compact crossovers. 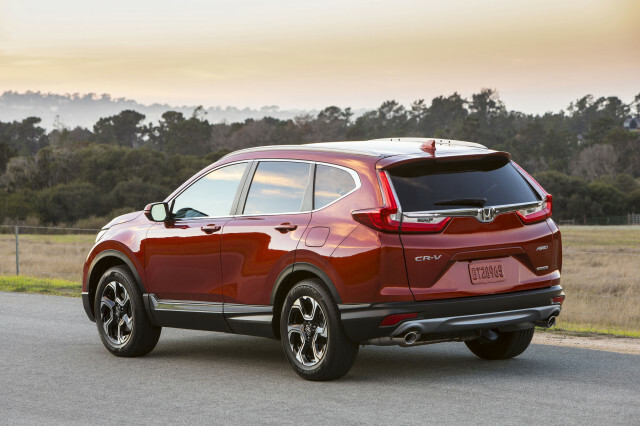 The EPA rates the turbocharged CR-V at 29 mpg, while the Forester comes in at a still impressive 28 mpg. The Forester solidifies its four-wheeling credentials with standard all-wheel drive and ample ground clearance. Higher trim levels also feature an X-Mode switch that recalibrates the traction control system for slippery surfaces. Neither crossover is particularly adept at towing. They’re rated for 1,500 pounds, which is basically a small utility trailer. On the safety front, both crossovers generally score well. They share a five-star NHTSA rating and score a Top Safety Pick award from the IIHS when fitted with automatic emergency braking. 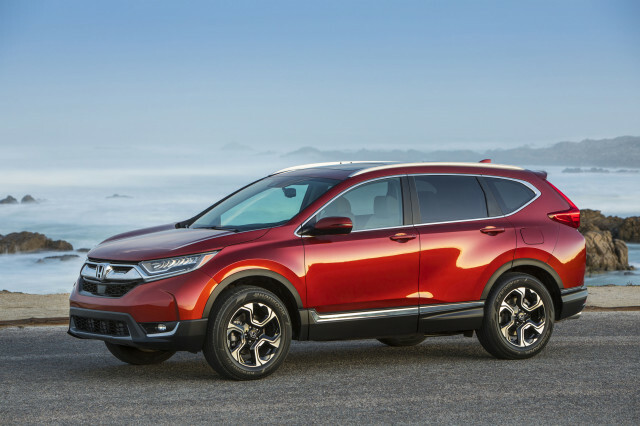 That gear, bundled with adaptive cruise control, active lane control, and blind-spot monitors, is standard on CR-V EX and higher trim levels, where it is called Honda Sensing. 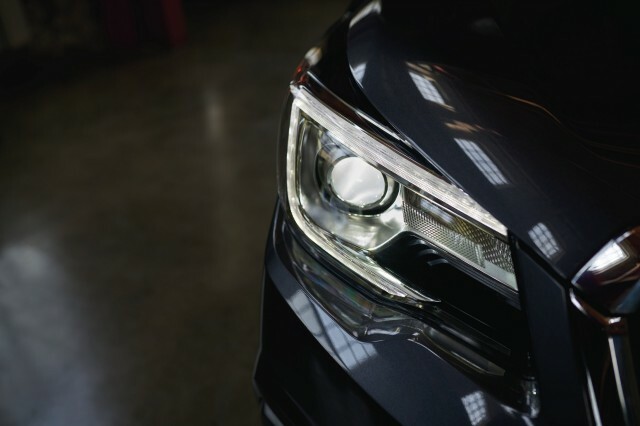 Tech that delivers roughly the same functions—minus active lane control—is branded as EyeSight on the Subaru and it is standard on range-topping Forester Tourings and optional on most other trims. The Forester’s sub-$24,000 base price undercuts the cheapest CR-V by about $1,000, but it’s hardly an apples-to-apples comparison. For that money, the base Forester has a 6-speed manual and all-wheel drive, while the base CR-V LX uses a CVT to send power to the front wheels. Most shoppers will probably start with the CR-V EX and the Forester 2.5i Premium, which add in some niceties and can be further outfitted with more gear. An all-wheel-drive CR-V EX runs about $29,300, while an equivalent Forester 2.5i Premium with EyeSight stickers at about $28,800. 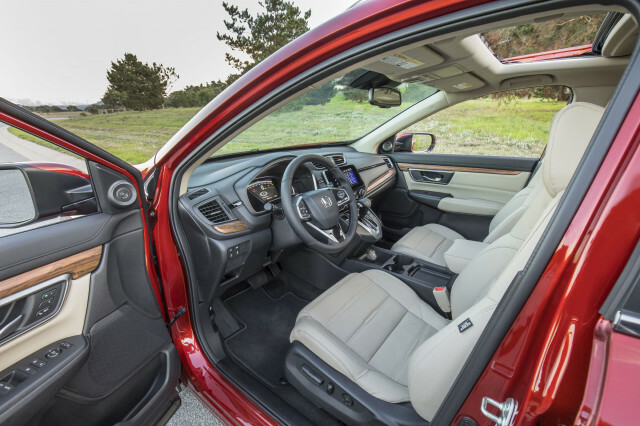 Add leather and navigation and you’re looking at the CR-V EX-L for a hair under $33,000 or the Forester 2.5i Limited with optional EyeSight at $33,300. All in, a loaded-up CR-V Touring lists for a little over $35,000. A Forester 2.0XT Touring tips the scales at $37,000, albeit with the far more powerful turbo engine that could come in handy on the way to a cabin in the mountains. If you prioritize a comfortable ride and a hushed, luxurious cabin, the Honda CR-V should be at the top of your shopping list. However, don’t discount the Subaru Forester; its rugged virtues may be more appealing to those who prefer to wander the countryside. City mouse, country mouse, indeed. The clean, straightforward design of the 2018 Subaru Forester is let down only by the turbo model’s excessive add-ons. We’re impressed with the 2018 Honda CR-V’s clean, organized interior, but its exterior is a little too quirky. The 2018 Honda CR-V has a good ride and a willing turbo-4 engine option. The 2018 Subaru Forester isn’t close to luxurious, but it’s hard to beat for interior space to hold both people and their gear. The 2018 Honda CR-V is brilliantly packaged inside with far more room than you might expect available for passengers and their gear. 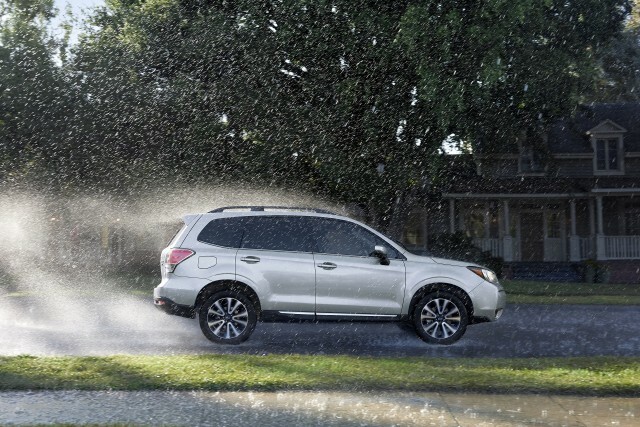 Top safety scores and continual updates to safety features put the 2018 Subaru Forester among the safest cars in its class. The 2018 Honda CR-V offers lots of advanced safety tech and has done well in crash-testing. The best value in 2018 Subaru Foresters is a base model with manual gearbox, but it’s still decently priced after adding fancy audio, leather, and a moonroof. The sweet spot here is the well-equipped 2018 Honda CR-V EX; add leather if you want. 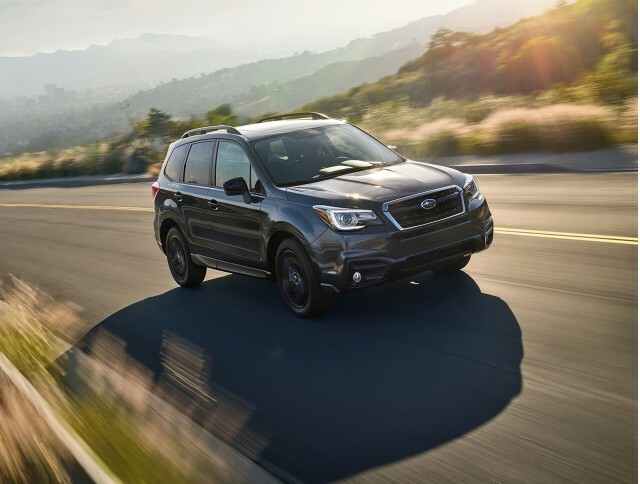 The 2018 Subaru Forester delivers good fuel efficiency given its standard AWD, but the field gets tougher every year as competitors improve. You’ll find good fuel economy at every level with the 2018 Honda CR-V. There are no Honda dealers in our network that are located near the ZIP code. We have sent your request for price quotes on the 2018 Subaru Forester and 2018 Honda CR-V to the dealers you requested. They should be in touch shortly. Your request for a fast, free price quote on a 2018 Subaru Forester and 2018 Honda CR-V is in process. The CarsDirect Dealer(s) listed below will contact you shortly to discuss your request and to provide a quote.